Healthy Toast – 3 Delicious Ways! Spicy Bacon Guacamole Dip – With A Secret Ingredient! Green Goddess Spring Salad – Healthy & Fresh! Easy Peasy Egg Cups – Food Prep Like A Boss! Natural Beauty: I’m Loving… Oil Pulling! 3 Simple Ways I Have More Protein Without Eating More Meat! Vegan Burgers, Fresh & Fit Festival, and Pancakes! 5 Healthy Pancake Recipes For Pancake Day! My LA Trip – Where to Eat, A Hollywood Hike, and Harry Potter World! My Birthday – Vlog, Vegan Cupcakes, Burgers & Bowling! The CREAMIEST, DREAMIEST avocado sauce. It’s just perfect for those days when you’re not really feeling a heavy sauce, but don’t necessarily want to go with light a tomato sauce either. It’s balanced and so flavourful, making a comforting bowl of pasta that doesn’t leave you feeling weighed down. If you’re now converted to the avocado sauce obsession, I’ve made avocado sauce on here before – check out this Creamy AF Avocado Pesto Pasta and this oldie but a goodie Avocado Salad Dressing. Scoop your avocado flesh into a blender and add the remaining ingredients. Blend until super smooth and creamy, adding more liquid if necessary - either your milk of choice or water. Taste and adjust any seasoning, and serve! Keeps in the fridge for about 3 days sealed in an airtight container or jar. If you're adding it to pasta, gently heat up in a saucepan until bubbling and stir through pasta plus a handful extra greens. Top with some roasted tomatoes, or pine nuts, for extra oomf and add your favourite protein to keep you feeling fuller for longer. Top Tips: My Secrets of How To Sleep Like a Baby! Hi, I'm Teffy, a qualified Nutritionist and avid foodie. 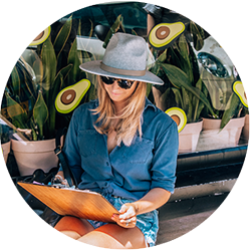 This blog is all about inspiring a balanced life through delicious and wholesome foods, with not a diet in sight. Healthy eating shouldn't be hard and stressful, it should be easy and fun - Working with my clients they are constantly amazed that yes, food can taste great AND be good for you! Hey Buddy!, I found this information for you: "Uber-Creamy Green Dream Avocado Sauce Pasta". Here is the website link: https://www.sprinkleofgreen.com/uber-creamy-green-dream-avocado-sauce-pasta. Thank you.